Many things have slipped from my routine the last few months: writing, running, and practicing among them. Unfortunately I have also devoted less time to my prayer life, something that has me chagrined, even as I try to convince myself that this is just a season, and that all the things I can’t quite fit as often as I would like these days will continue to be a part of my life. I was already planning to find a prayer book for Advent, in hopes that I could kick start my prayer during this liturgical season I love so much. 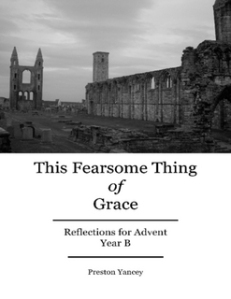 I was thrilled to discover that blogger, tweeter and friend Preston Yancey had published an e-book with daily reflections based on the Scripture readings in the 1979 Book of Common Prayer. He was gracious enough to let me preview a copy, and I am happy to report it exceeds my (high) expectations. My conversion to iPad has been recent and reluctant, so I wasn’t sure how I would like the e-book format. Uncharacteristically, I approached it with an open mind, and found This Fearsome Thing of Grace extremely easy to read. Preston includes links to the readings of each day, adding to the ease of use. Most days’ reflections tease out a particular line from the Scripture. Preston brings his diverse knowledge to these Scriptural nuggets, using literature, history, patristics, and liturgy to suss out a particular theme in the readings. This is no thoughtless piety but a close reading of Scripture, history, and the signs of the times. The richness of these reflections is impressive and inspiring. The danger, of course, when being so comprehensive in one’s reflections is that what should be a prayer book turns into a book report. Preston avoids this peril. This Fearsome Thing of Grace is obviously written by someone with a prayer life. Through each reflection he never loses sight of the mystery of the Incarnation, that what we marvel at throughout Advent is that “Christ our Lord hallowed this wounded thing we call body” as we wait in joyful hope for Christ to come again.